Between 90 and 95 percent of cases of diabetes in the U.S. are Type 2. In the long term, this condition, if not properly managed, increases the risk for several health complications, including heart disease, blindness, kidney problems and limb amputations. Now, research suggests that Type 2 diabetes may also be linked to mild cognitive impairment, as published in the Journal of Alzheimer’s Disease. Experts describe mild cognitive impairment as an intermediary state between normal cognitive function and dementia. While some people who have mild cognitive impairment go on to develop dementia, it is possible to stop or even reverse the process. The new study suggests that this reversal may depend partly on good blood sugar control. There are two types of mild cognitive impairment. The form of the disease that affects the part of the brain that is responsible for memory is referred to as amnestic mild cognitive impairment. By contrast, non-amnestic mild cognitive impairment affects parts of the brain not associated with memory. Previously, studies showed that there was a link between chronically high levels of blood sugar and the presence of toxic proteins in the brain. Additionally, insulin resistance hurts the brain cells’ ability to use sugar for fuel. 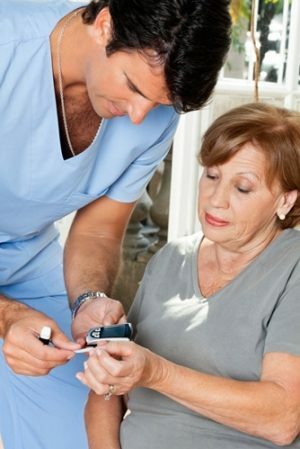 Both high blood sugar and insulin resistance are traits of Type 2 diabetes. To get a better understanding of how Type 2 diabetes can elevate the risk of mild cognitive impairment, a team of researchers analyzed data collected for the Heinz Nixdorf Recall study in Germany. Specifically, they compared 560 individuals who were diagnosed with mild cognitive impairment to 1,376 people who were neurologically healthy. Results showed that mild cognitive impairment was two times more likely to develop among those who had Type 2 diabetes, compared to the rate seen in the other group. Furthermore, this link was only seen among those who were 50 to 65 years old. No such relationship was seen among adults between 66 and 80 years old. Other results showed that middle-age women with diabetes were more likely to develop the amnestic form of mild cognitive impairment, while middle-age men with diabetes more commonly had the non-amnestic type of disease. The authors of the new study suggested that adequate management of diabetes may help or prevent cognitive decline. If you’ve been recently diagnosed with Type 2 diabetes, the first thing you need to do is learn how to measure and monitor your blood sugar levels. When it comes to your diet, it’s important to find the right balance of protein, fat and carbohydrates. Regular physical activity will also keep the blood sugar levels in check. In some cases, doctors prescribe medications to help control blood sugar. Ultimately, controlling your diabetes is not just about managing everyday symptoms. It’s about protecting your long-term health. If you have Type 2 diabetes and you want to know more about how you can keep your brain as sharp as possible for as long as possible, it may be beneficial to consult with a professional who can develop a personalized healthcare plan with you. Click here for more information.